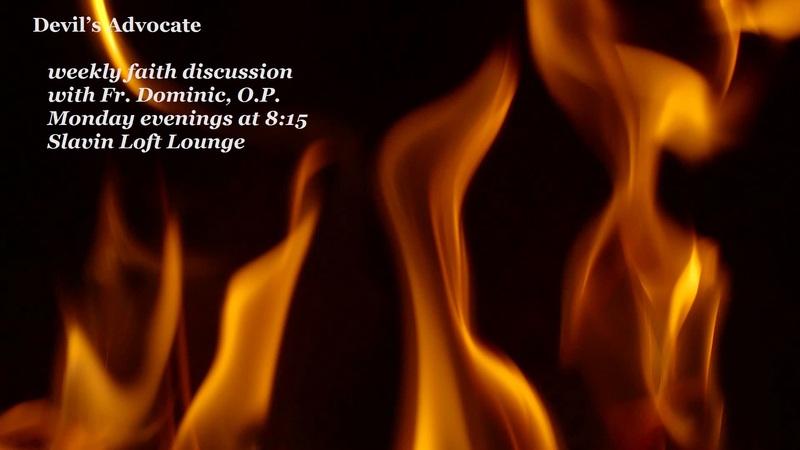 Devil’s Advocate is a question-answer faith discussion group hosted by Fr. Dominic, O.P. and Fr. Bonaventure, O.P. At each weekly meeting, a coin toss determines which of the two Dominican Friars will be the Devil’s Advocate and which will be the defender of the Catholic teaching on some controversial matter. The Friars initially grill each other with tough questions to get the discussion rolling, and then the discussion opens up to audience participation, so that everyone is free to intervene with their own questions, objections, or responses. The excitement occurs every Monday night at 8:15pm in the Slavin Soft Lounge (LL01). You can submit your questions ahead of time in one of the tough question mailboxes in Slavin or the Campus Ministry Center or by submitting them online at www.bit.ly/DevilsAdvocateQuestions. Bring your questions and bring a friend!